Few things in life inspire us as much as a personal story. I love them. To me, the best ones usually involve a pick-myself-up-from-the-bottom narrative. Let me tell you mine. I am the CEO of OneTweak Pedometers. After spending decades in the Middle East raising five children, I returned to the US and discovered computers. I reveled in the cornucopia at my fingertips. Every click brought something to twizzle over; my viral world riveted me. Hooked me. Obsessed me, even. Soon, I spent as many as sixteen hours a day on the computer. I discovered research capabilities unimaginable in a world sans computer. A world’s database bowed before me. I devoured it. But this veritable feast had a downside. I viewed life from the viral edges; I didn’t fully participate in it. My computer steeped me in the tawdry entrails of human existence on a large scale. I began to feel depressed. My stamina withered into nothingness. My obsessive computer stints literally deprived my body of movement, as necessary to the human physiology as oxygen. Worse, my should-be-retired husband of forty-two years had returned to work overseas, leaving me alone for the first time in my married life. I don’t do ‘alone’ well. We decided to start selling pedometers on Amazon. Newbies in the world of marketing, we dubbed ourselves OneTweak. Our name represented our belief that we would find a product that ‘tweaked’ our lives and those of our customers in a positive direction. And, we would ‘tweak’ that product in at least one way to make it better. I felt ethically compelled to test our pedometer and those of our competitors. I began to walk. A lot. I went from sedentary to mobile. I sought a pedometer that did not require an online interface. My goal was to wean folks OFF the computer -reduce their sittin’ down time– not seduce them onto one to view their metrics and compare them with others. Then, everything changed even more. My world grew increasingly lovely. I began to skype my husband every day about business and brass tacks. We were apart but together. Geography was no longer our tyrant. My energy sky-rocketed. I immersed myself in goals and productivity. I gentled ‘in the moment.’ Walking gave me time to ponder metaphysical abstractions and everyday logistics. Walking gave me energy. I lost weight. My outlines morphed. My insides morphed. Hope and I began to swap howdys. lot to learn about customer interface and Amazon metrics. I dabble in website construction. I have discovered the power of social media and am learning how to mobilize it for our business. I encountered Pinterest and Instagram for the first time. New worlds are opening up to me. I don’t think it is hyperbole to say that a pedometer can be life-changing if it gets you to walk more…to live more. No doubt, OneTweak is a ‘work in progress.’ And, I have a lifetime. To walk toward the goal posts. If YOU have a story about your pedometer experience or walking’s impact on you, I’d love to hear it. I’d also love to post it on our blog… with your permission, of course. You can remain anonymous OR you can be the named author. Your story can be short or long, with a picture or without, funny or serious. Anything works. 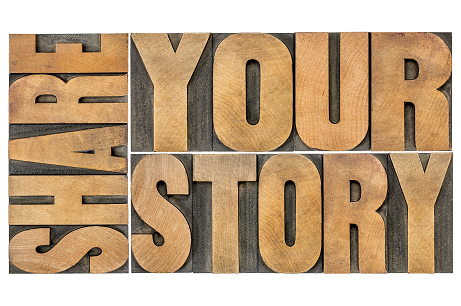 Remember…your story is YOUR story. I believe your narrative can be transformative. We live and revolve in a couch-potato nation filled with folks just like me…nibbling around the edges of life. Tell your story and change the world nibble by nibble!